I recently performed a direct SIP trunk integration between a Mitel SX3300 PBX and Microsoft Lync Server 2010. Mitel have published a technical reference for direct SIP connectivity with Lync Server 2010, however this predominantly focuses on the configuration of the SIP trunk from the Mitel side as you would probably expect and the technical reference does not go into detail about what configuration is required in Lync Server 2010 in order to establish connectivity. The following information focuses on the Lync Server 2010 configuration for direct SIP connectivity and does not discuss the Mitel SIP or ASR rules required when placing calls through the 3300 gateways, this information focuses obtain the configuration of PSTN gateways in Lync Server 2010 for Mitel integration only. 1. Obtain Mitel technical reference SIPCoE 11-4940-00161 from the Mitel portal if you have an authorised account or from your PBX vendor. Alternatively you can view the configuration PDF file from here. Although this information is written specifically for MCD 4.2, the SIP trunk integration will work with lower software revisions, you will however notice some of the SIP configuration options detailed in the PDF will not be available in lower revisions. 2. Once the Mitel side of the SIP trunk has bee configured, connect to your Lync Server 2010 front end and open the topology builder. Once the topology builder has opened ensure that you have the mediation server role installed within your topology as this will be required when configuring Lync users for enterprise voice. If this feature is not installed, proceed and install the mediation server role before continuing onto step two. 3. Once the mediation server role is installed, navigate back to the topology builder and expand the “Mediation Pools” container. You should now see the FQDN of the server that holds the mediation role. Right click this object and select “Edit Properties” to invoke the properties window. Within the properties window check the “Enable TCP port” option and then continue to set the TCP listening port to 5060 as for the Mitel SIP trunk side the target TCP port for connectivity is 5060, so we need to ensure our mediation server is listening for requests on this port. An import thing to note here is that if you have any trusted applications, such as RCC integration or Cisco CUPS that already utilise port 5060 you will need to change the mediation server listening port and the destination TCP port of the Mitel SIP trunk to ensure the integration works correctly. If you are in this scenario I recommend setting the mediation server listening port to 5068 and also setting the target TCP port on the Mitel SIP trunk to 5068. The following screenshot illustrates the mediation server role configuration that is required. Once the port has been set, continue and publish the topology to the CMS. Once the publishing has completed, either restart your front end server or restart the mediation server service. This is required so that the new mediation server port is enabled and listening for connections on the front end server. To confirm this, open a new command prompt window and type “netstat /an” and press return and you should now see the server listening for connections on port 5060 or port 5068 depending on your scenario. 4. Once the mediation server is now listening on the correct port, the required PSTN gateway can be added to the topology. 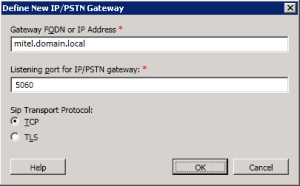 In the topology builder right click the “PSTN Gateways” container and select “New IP/PSTN Gateway”. In the gateway dialog box enter the IP address or FQDN of the Mitel PBX you are establishing the SIP trunk to and then proceed to set the listening port to 5060 and the transport protocol to TCP. For reference the Mitel side of the SIP trunk will only accept inbound connections on TCP port 5060. Once this has been completed, click OK and return to the topology builder and then publish the topology. 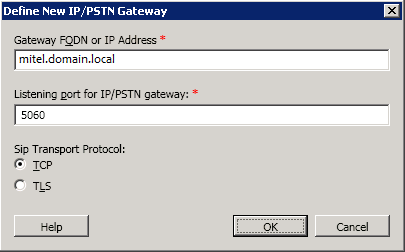 The following screenshot details the PSTN gateway configuration. 5. In the topology builder window expand the “Mediation Pools” container, right click the FQDN of your mediation server and select “Edit Properties” to invoke the properties window. You should now see the IP address or FQDN of your Mitel PBX as a PSTN gateway that can be associated with the mediation server. Highlight the created PSTN gateway in the unassociated gateways field and then click “Add” and click OK. Following this, continue and publish the topology before continuing to the next step. 6. Open the Lync Control Panel and navigate to Voice Routing -> Trunk Configuration and then click New -> Pool Trunk, when prompted select the PSTN gateway you have just created. For the direct SIP connectivity to work with Mitel systems we need to disable RCTP and refer support as Mitel does not support this functionality, you will note this is detailed in the Mitel technical reference on the final page of the document. Mitel do recommend enabling media bypass, however in Lync Server 2010 to achieve media bypass enablement with refer support and RCTP functionality disabled we need to perform some specific steps. Proceed and uncheck the “Enable refer support” and “Enable Media Bypass” boxes in the pool trunk window and then click OK. When back in the main trunk configuration window click “Commit” and then select to commit all changes. The following screenshot illustrates the aforementioned configuration. 7. Once the gateway has been added in the trunk configuration open the Lync Server Management Shell and run the following PowerShell commands to disable RCTP functionality. In the below example my PSTN gateway is called mitel.domain.local, please replace this FQDN with your own Mitel system when running the following commands. 8. Once the PowerShell commands have been executed return to the Lync Control Panel and navigate to Voice Routing -> Trunk Configuration. Select to edit your pool trunk PSTN gateway and in the configuration window check “Enable Media Bypass” and then click OK. When back in the main trunk configuration window click “Commit” and then select to commit all changes. The configuration of the SIP trunk is now complete, once a dial plan, voice policy, PSTN usage and route have been configured you should now be able to call between Mitel and Lync users and also pass calls to the PSTN once the Mitel ASR rules have been configured. 1. In the OCS 2007 R2 Administrative Console, expand Standard Edition Servers, expand your servers computer name and then right click the “Users” container and click “Delete Users”. Follow the presented wizard to remove all OCS attributes from your SIP enabled user accounts. Note: This does not delete your Active Directory user accounts, it simply SIP disables the users. 2. Right click your servers computer name and select “Deactivate”, then proceed to deactivate each role in the following order. Performing these steps in the incorrect order will impact the uninstallation of the product. Front End Server – If deactivation fails, run this again but check the force option. 3. Once the deactivation is complete, go to the control panel of your server and select either Add/Remove Programs or Programs & Features depending on your operating system version. Proceed and remove the following services in the below order. 4. Demote your server from the domain and proceed to delete it’s Active Directory computer account and its associated DNS A and SRV records. That’s it, you have successfully removed Office Communications Server 2007 R2 from your environment. If you have a requirement to unprepare your domain or forest there is some good information on performing this here.